Kickin' my behind is what the chemotherapy drugs are doing. Last time around they knocked me down and out and this time isn't any different. Tuesday-Wednesday-Thursday-Friday-Saturday I feel great (thanks, steroids!). I take the chemo stuff on Saturday, and wind up having a sucky Sunday and Monday. The pattern has already re-established itself. Today I had my heart set on finishing the Disaster Auction quilt and even had the entire day to finish it. I'd work for a little while, then get too tired to do anything but sit in my recliner. And wouldn't you know it, every time I sat in my recliner today I fell asleep? Three, four, (or was it five?) different times. 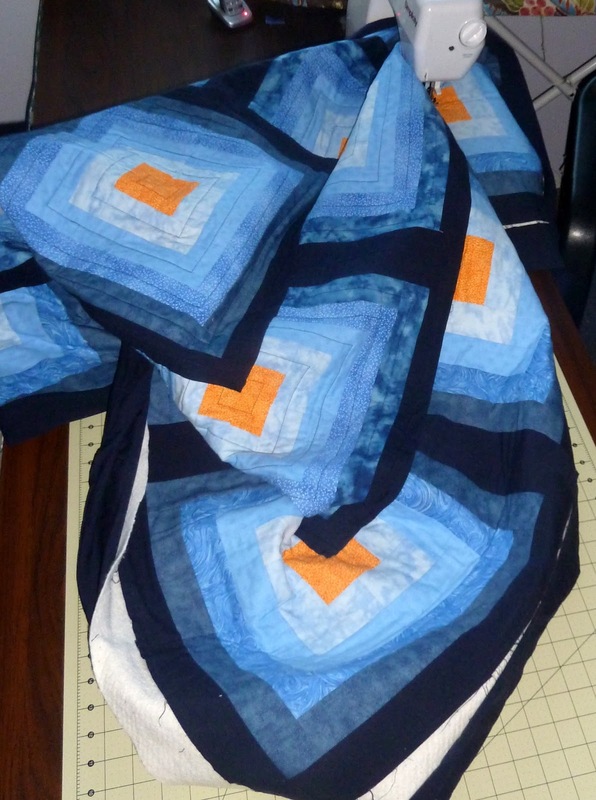 Sleep, back to quilting, sleep, back to quilting. Again and again and again. I'm certain I'll be able to finish the quilt this week, but as for tonight a picture of a partly-finished quilt will have to do.